Following the Japanese bombardment of the US Naval base at Pearl Harbor, Hawaii, on December 7, 1941, the United States declared war on Japan and Germany and immediately mobilized the country for war. "Remember Dec. 7th!" is a propaganda poster intended to promote a sense of nationalism and boost support for the war effort. It combines imagery suggesting the destruction of the base—smoke and a tattered American flag—with a quotation from Lincoln’s Gettysburg Address: "We here highly resolve that these dead shall not have died in vain." Invoking Lincoln could both give comfort to Americans and remind them of the sacrifice of previous generations. 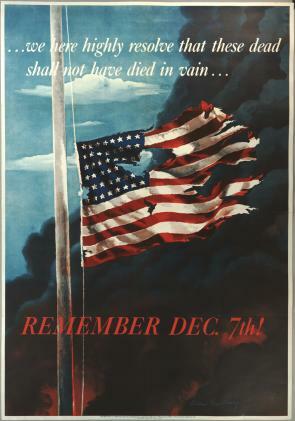 Printed early in 1942, it uses the phrase "Remember Dec. 7th" rather than "Remember Pearl Harbor," which is a slogan that became prevalent later in the war. How did the artist use the position of the flag on the pole to explain what President Franklin Roosevelt called “a date which will live in infamy”? List three or four words to describe the emotional reaction Americans had upon viewing this image in 1942 and then explain your choices. When the Twin Towers of the World Trade Center were attacked, some Americans said that they would remember September 11, 2001, just as a previous generation remembered December 7, 1941. Why did many Americans make that comparison? Interview a person who has visited Pearl Harbor or explore the National Park Service website to learn about such sites as the National Monument for World War II Valor in the Pacific, which commemorates Pearl Harbor. How does the National Park Service continue to honor the memory of those Americans who served and died at Pearl Harbor?